Less-lawn solution: Outside a kitchen or home-office window, position shrubs that provide food and cover for birds, such as highbush blueberry (Vaccinium corymbosum), red osier dogwood (Cornus stolonifera), common spicebush (Lindera benzoin), and viburnum varieties. Add a small water feature—a birdbath or fountain—as the focal point. Then, when you want a distraction from the mundane tasks, you can watch the wildlife. 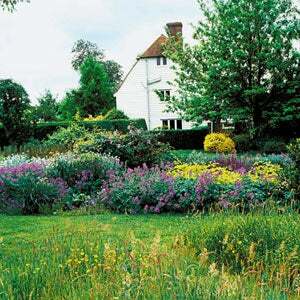 If you have the space, establishing a "minimeadow" as a border or boundary area is another effective way to attract birds, as well as beneficial insects. Native plants like goldenrod, sunflower, and coneflower supply nectar for butterflies and, in fall, produce seeds for birds to enjoy. Make sure you have a sunny site—and can tolerate a weedy look at the edge of your property. Check that you won't run head-on into local ordinances or subdivision rules that require lawns to be mowed to a certain height. 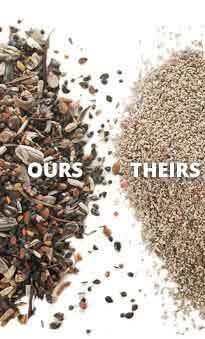 At American Meadows, you can find seed mix custom-blended for your part of the country. Watching what happens is part of the fun. Cornflower, cosmos, and other annuals typically grow quickly and put on a great show the first year; then perennials come on stronger and eventually take over.